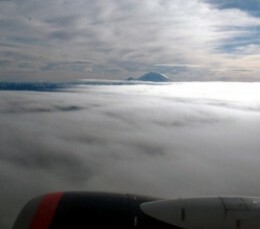 I took this picture in 2009 over the Cascade Mountains of Washington State. I frequently fly across the United States to visit my family. Are you planning a trip? Have a flight booked? Wondering what to expect? Here’s my advice, based on my experiences at the airport and in the airplane. It’s my hope that these tips make flying easier for you! If someone else is dropping you off, then they will probably want to follow the signs for “Departures.” Usually there is a place for them pull-up and drop you off at the curb. Look for a sign with your Airline’s name on it. Or, know which terminal you’re flying out of and be sure to go to that terminal. This will get you to where you need to go the fastest. If the person dropping you off at the airport wants to go in the airport with you, then they’ll want to look for a short term parking lot. If you’re driving yourself to the airport, then you’ll need long term parking. You may want to research the parking online ahead of time. Try a google search for airport parking along with the airport name. There may be cheaper parking lots just outside of the airport and these lots usually provide a shuttle bus to the airport. Long-term airport parking tips: how to ensure your spot in a crowded lot. A few tips about parking your car before going on vacation. 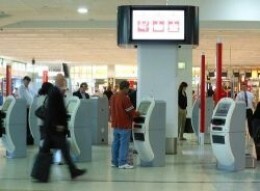 Use Computer Terminals to Check in – They will print your boarding pass! After parking, usually the first thing to do at the airport is to check-in. Sometimes you can check-in online up to 24 hours before your flight. If you have a printer, then go to your airline’s website and see if you can check-in and print out your boarding pass. This can save you time at the airport. Checking-in is the process where you present your ticket information and receive a boarding pass. The boarding pass is a piece of paper that you need to get on the plane. You also need it before going through security. To check-in at the airport, find a computer or customer service agent for the Airline you’re flying on. At the computer, you will be asked for the ticket number, confirmation number, or alternatively you may be able to present a credit card or ID. Note that you have to do this at the computer or counter for the airline you are flying on. Each airline has its own computer system and their own employees! At check-in, you will be asked if you have baggage to check-in. If your bag is too big for carry-on, you will have to check-it. They will weigh your bag and put a label on it. You will get a receipt for your bag. Keep this receipt incase there’s a problem. Once you have your boarding pass and you’ve checked your bags, you’re ready to go through security and to the gates! 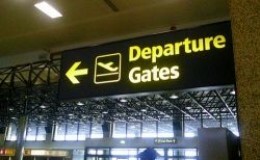 The gate is where you get on the plane! It used to be that you could just walk out to your gate and wait for your plane. Your family could accompany you and it was fun for everyone. But because of the 9/11 terrorist tasks, now there is comprehensive airport security administered by the Transportation Security Administration (TSA). You have to go through security to go to your gate. Before entering security, say goodbye to anyone who’s not flying with you — they won’t be able to go through security without a boarding pass. Security usually involves taking off your shoes and coat, putting your belongings on a conveyer belt which goes through an x-ray machine, and then you either walk through an X-ray machine and/or a full body scanner. There are lots of details, so be sure to visit the following websites to learn all about the process. Are you traveling with infants, babies, or small kids? Learn about the TSA security guidelines. At some airports, you have to go through a full body scanner. The alternative is a pad down. Here’s some facts about full body scanners: how many airports have them, how they work, their safety, etc. You can only bring small quantities of liquids and gels. Read these rules. You will need to present a Driver’s License, Passport, or other ID. Each airport may have several terminals, and each terminal may have one or more concourses. Each concourse has many gates. Follow the airport signs to find the gate. The gate is listed on your boarding pass. However, it’s subject to change, so you may want to verify the gate by looking at the computer display. Most airports have large computer screens or TVs that list the current departing flights and the gate numbers. When you get to your gate, read the sign at the gate to see if it lists your flight. If you arrive early, you may want to take this time to use the restroom or buy food or water. Most terminals have stores, cafes, and restaurants. Some airports are so big that there are trains (often underground trains, similar to subways) that connect the terminals, or that connect the airport to parking. In preparation for your trip, you may want to look at an airport map to become familiar with its layout. Something to do on the plane: book to read, MP3 player & headphones, movie to watch on your laptop, etc. Camera & extra batteries – it’s not every day you have that kind of view! Hand Sanitizer – try to stay germ free. Medicine – bring it with you. Do not check it! You want to have it on you incase you need it. Gum or Candy – Your ears will pop because of changes in air pressure. These will help you to swallow frequently, which encourages changes in your ear pressure. These ear plugs get rave reviews. When I was a teenager, the change in air pressure caused me a lot of discomfort. Fortunately, as an adult now, something has changed, and I don’t have the problem anylonger. However, if you think you might be bothered by it, these might be worth trying. The length of a plane trip can seem dauntingly long. However, the length of your flight includes the time it takes for boarding the plane and taxiing on the runway, so the actual time in the air is usually much less. Sometimes there are delays before your plane can take-off. At some airports, the plane may have to wait in line before take-off. Also, sometimes there is a delay before you can land, and the airplane may go into a holding pattern in the air. This means that the airplane may circle past your destination and then return. On some airplanes, you can see the plane’s location on a screen. I always find this reassuring! You have to turn off your electronics at the beginning and the end of the flight, but while you’re at cruising altitude, you can use them. You can never smoke on the plane and most planes have a sign lit to constantly remind you of this. You can, however, get up once the seatbelt sign goes off. If the pilot expects turbulence, then the seatbelt sign will go back on. For your safety, it’s best to keep your seatbelt on while sitting. While I’ve never experienced severe turbulence, occasionally people do get hurt from a bumpy ride. Fortunately on most flights I’ve been on, turbulance has been minor, and most of the flight has been smooth. If you have a window seat, take some pictures! Bring along a radio and some headphones. You can listen to radio while flying! It’s always interesting to see what stations you pick up. I like to use my MP3 player which has an FM tuner. You can make time go by faster by watching a movie. Often you can watch a movie provided by the plane. Sometimes this is free and sometimes this costs money. Sometimes they will even have TV programming. You can always bring a laptop and a DVD (or a tablet with a movie on it) and watch that. Just make sure that you have enough battery charge. If you’re going to listen to music, remember to bring CLOSED headphones… – Airplane engines are LOUD! You’ll either need closed headphones or, even better, noise canceling headphones. If your flight is not direct, then you may have to switch planes at another airport. When you get to the airport, you will get off the plane with everyone else, and then you will want to find the gate for your next flight. Usually, as long as your next flight is from the same airport, you do not have to go through security again. You may have to go to a different terminal. If it’s a big airport, this means you might have to walk a lot. If you have enough time between flights, then you may be able to get a meal at the airport. A stop over or layover can cause anxiety for first time and inexperienced travelers. The good news is that many other people will be switching planes too, so your experience will be quite common, and if you are ever unsure of what to do, don’t be afraid to ask. Read advice about an international stop over. Learn what a stop over is and the difference between that and a layover. “What happens on a flight stopover?” – Find the answer to this question and millions more on Yahoo! UK & Ireland Answers. If you have a long layover, or if you arrive at the airport early, you may be able to request an earlier flight, free of charge. Find out how. What is a flight lay over time? Guide for first time flyers. How to make transfers between flights as comfortable as possible. What if I miss the connecting flight? If your plane is late, you might miss a connecting flight. If both flights are with the same airline, you may be automatically scheduled to go on the next flight. Look for the customer service counter for your airline. They will be able to help you. Recommended Items for Getting Sleep on the Plane – Going on a red-eye flight? Or need to catch up on some sleep? Taking a red eye flight? 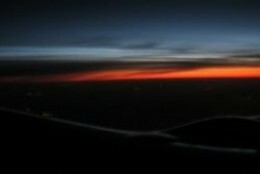 A red eye flight is a flight that leaves late at night and arrives early in the morning. These flights are often cheaper than daytime flights, and they offer a few other benefits, like arriving early in the day and traveling at off-peak times which means fewer crowds. However, if you don’t get some sleep on the plane, you’re going to be really tired. Here are some tips. Advice about feeling well after a red eye flight. Tips about surviving a red eye flight. Read some advice from frequent fliers. Resource site for first time air passengers. Topics include: airline ticket issues, packing your baggage, arriving at the airport, check in, security check, before departure, boarding, in the air, transfers, customs, flying with babies, and more. I hope that you enjoyed this guide for first time fliers. I’d love to have your input. Next My Weather Station – Best Christmas Gift Ever!